Did I Ever Tell You About the Time We Accidentally Went to London??? What doesn’t show up in this picture is the fact that it was taken without the use of thumbs. I accidentally stole some dog food once. It was one of those huge bags, and I’d put it on the bottom of the shopping cart. The line was long, I loaded up the conveyor belt with all my groceries, and didn’t realize I’d forgotten to pay for it until I was out at the car. Happens to everyone, right? I also accidentally punched my college roommate in the nose. We were screwing around, throwing fake punches, copying some ninja movie we’d just watched on TV. Without trying to, I suddenly connected – hard – square in the nose. I was gushing apologies while he was gushing blood. Could have been anybody, right? Believe it or not, I actually accidentally got a part in a movie one time. In college, I showed up at a casting call for a big budget film being shot in Chicago. I just wanted to hang out with some friends and get a peek at how movies are made. Instead, by inadvertently standing in a crowd of really short people, I made myself look like some sort of giant. The casting director pulled me aside since I appeared to be big and strong, and next thing you know it, I had a part in the film and was in full SWAT Team gear getting trained on how to hold my weapon and storm a hostage situation. Anyone of average height could have had it happen to them, right? Those were all cool, but did I ever tell you about the time I accidentally went to London? I suppose this one could have happened to anyone, but it happened to me and the 30 students, parents, and teachers I was travelling with. We were on our way from Chicago to Athens. There was supposed to be one of those insanely short layovers in London – you know the kind of layover – the ones where you wonder how they’re legally allowed to inflict that kind of stress on a human being – the kind where you have a map of the airport and plans to sprint wildly from the far end of one terminal to the deepest, darkest recesses of the other one to the other just to have a shot at making your connection. The kind where there’s always a massive group of jet-lagged zombies standing still on the moving sidewalk, a line of starved/bored people eager to fork over nine dollars for an absurdly dry sub sandwich is blocking the main walkway, and there’s been some sort of mishap with the airport golf carts – leading to a ten cart pileup that prevents traffic from getting through. Some kind of weather issue in Chicago made making that second flight seem even less likely, because we boarded and took off from O’Hare about eight minutes late. Eight minutes. That’s it. Can’t you make up eight minutes in the air? Can’t you hold the next plane for eight minutes? Eight minutes is not a lot of time. You can’t even cook a frozen pizza in eight minutes. You can’t watch half an episode of Spongebob in eight minutes. You can’t even listen to all of Freebird in eight minutes. What are eight measly minutes when you’re talking about a seven hour flight across the Atlantic? The gate agents, the flight attendants, heck, probably the pilots, their mothers, and the Supreme President of Airplanes were all aware of the size of our group and the need to make that connection. You see, we didn’t have much wiggle room on the Athens end of our itinerary. We had just half a day on the mainland in Greece before we were set to board a cruise ship – a ship that if it left without us, it left without us. Even though all those airline folks knew the time crunch we were up against, all we got was an apologetic smile, another map of Heathrow, and some food vouchers. 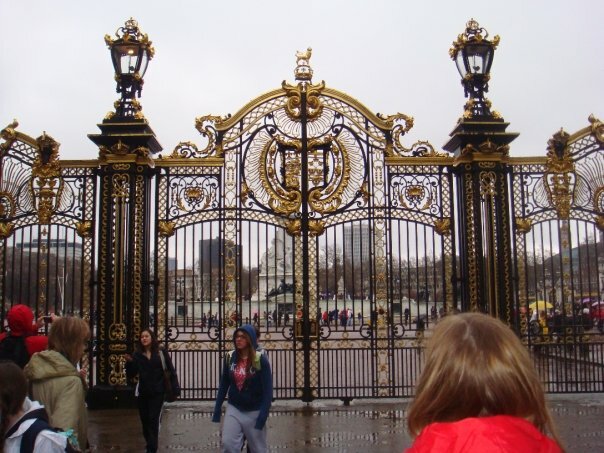 Surprisingly not visible in this picture of Buckingham Palace’s gates – some incredibly stylish and grippy mittens. “Looks like you’ll miss your connection,” we were told. “You’ll probably have about thirteen hours on the ground in London before we can get your whole group on a flight.” Thirteen hours!?!?! You’re kidding, right? An eight minute delay is going to cost us thirteen hours? They weren’t kidding. What are we supposed to do with 30 students in an airport for thirteen hours? They didn’t seem terribly concerned with answering that question. There was begging. Begging doesn’t often work. There was pleading. Pleading was less effective. I thought about swearing and calling someone’s mother a dirty name, but that probably wouldn’t have gone over any better than the begging and pleading did, so I took the map and started to make some plans. We called it Plan L, the L stood for London. Our trek around Greece was going to be delayed, because we were about to have an accidental adventure in England. Most of the flight was spent strategizing with a map of the airport, a map of the city, and a map of the Underground. There were “to-do lists” created, points plotted out on paper, schedules scoured. Pretty soon, thirteen hours didn’t seem like enough time to accidentally squeeze in all the accidental London we wanted to see on accident. When we got there, we took advantage of the meal vouchers we’d been given, and filled our bellies with English airport food, which may be the only world cuisine more tasteless than regular English food. Then we headed out into the Underground with plans to Tube our way around to all the major sites of the city. We quickly realized one major problem. Most of us were dressed for sunny spring days on a Mediterranean cruise liner. Instead we were in the middle of damp, cold London. Nowadays we have our students pack for an emergency landing in a cold climate, but that day we were not quite prepared for what hit us. The Underground was just fine, and so was the station, but when we popped up in the middle of Hyde Park to take a stroll over towards Buckingham Palace, it got real cold real fast. The slushy puddles and the group of girls that’d decided the most comfortable way to fly was light weight shoes that resembled ballet slippers did not make for a happy combo deal. That type of footwear doesn’t fly in wet London weather, but no one wanted to abandon the plan. Gosh darn-it, we were accidentally in London, and we were going to make the most of it. Buckingham Palace was cool, but we quickly moved on, cutting through St. James park – which is usually quite pretty, but that day resembled a field of icy sludge. What’s usually a nice cool breeze off the pond was instead piercing gusts of daggery ice winds, the kind of weather patterns normally only encountered by bands of traveling Hobbits. We were horribly under-dressed. Then inspiration suddenly struck the group. All at once, many of them realized their lack of packing foresight had been compensated for by airline hospitality. Each of us had received a pair of thick beige socks with little grippy rubber parts on the bottom. Almost all of us had a pair, but some of us were colder than others, so the socks were doled out the the tiniest, the least equipped for the elements, and the frozenest amongst us, but it was quickly realized that putting them on as socks just led to a new set of wet socks, no more warmth than before, and some useless (albeit grippy) footwear. So, instead, we figured out that they made fantastic sleeves. Pulling them over our hands, we could cover all the way up to the elbow, keeping our upper halves warm. It was a whirlwind tour of London, not a fashion show, so who really needed to look good or have the use of their thumbs? Besides, the grippy bits made it so we could still work our digital cameras like pros. 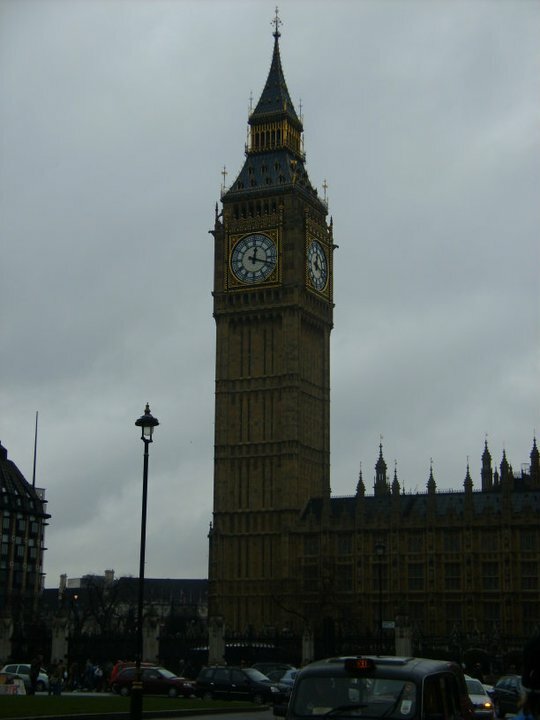 Our next stop, complete with thumbless photo taking, was Westminster Abbey, Big Ben, and Parliament. We’d planned on walking to Trafalgar Square after that, but instead opted to duck back down underground and huddle for warmth in the Tube station. Seriously, there was huddling going on. We were able to find a dry corner that blocked the wind and proceeded to huddle. With our fashion impairments and the cowering in corners of train stations, we looked like a traveling band of homeless people. We didn’t care. There may have been paper cups of tea and fresh scones who’s purpose was less of a nourishment thing and more of an edible hand warmer kind of deal. There may have been a very kind-hearted woman who dropped a strange British coin in my tea, thinking she was keeping a new-age Fagin and his army of sock wearing waifs from a life of crime. I didn’t drink any more of the tea, but I didn’t throw it out. It was sooooooo warm. We cut a few stops out of our initial agenda, but tubed our way over to The Tower of London. We didn’t have it in our budget to visit the inside, but we hiked around the castle, getting pictures from every angle, and found ourselves face to face with one of London’s most famous landmarks – The Tower Bridge. Most of the kids seemed to think it was the London Bridge they were looking at, but apparently they didn’t listen closely to the lyrics of that song, because they didn’t realize that one had fallen down. I didn’t have the stomach to break their frozen little hearts, so most of them probably still believe they stood next to the London, not the Tower, Bridge. A quick public restroom stop, which was less about peeing and more about using the hand dryers to thaw out our grippy mitten socks, and we were on our way back to the airport. No, we didn’t use our entire thirteen hours to see everything we could in London, but we saw a lot. Much more of England than we’d planned on seeing during our cruise around the Greek Isles. That wasn’t what it was about, though. It was about making the best of a bad situation. It was about taking life’s curve-balls and hitting them out of a ridiculously frigid park. Maybe what we really did was learn how to pack better and figure out some MacGyver-ish uses for complimentary airline footwear. Maybe we learned that accidents happen for a reason. Now if you’ll excuse me, I have a big bag of dog food that I forgot to pay for. Have you ever had any crazy travel experiences? Feel free to share them in the comments below. Glad you liked it Tyler. I did that once with a case of Coke too. I did go back and pay for both a few days later. I still have that coin, Ryan. I’ve saved it all these years. Maybe next time I’m in London I should give to an actual homeless person. So cool I hope your friend is ok haha! You get forgetful when you get older, Hunter. You got to be careful about what you put on the bottom of those shopping carts. They were both pretty cool experiences, but I went to the movie thing hoping to get a part and got one. I went to the airport planning on going to Greece and went to London instead.